Long sleeve silk Shirt dress with classic collar. 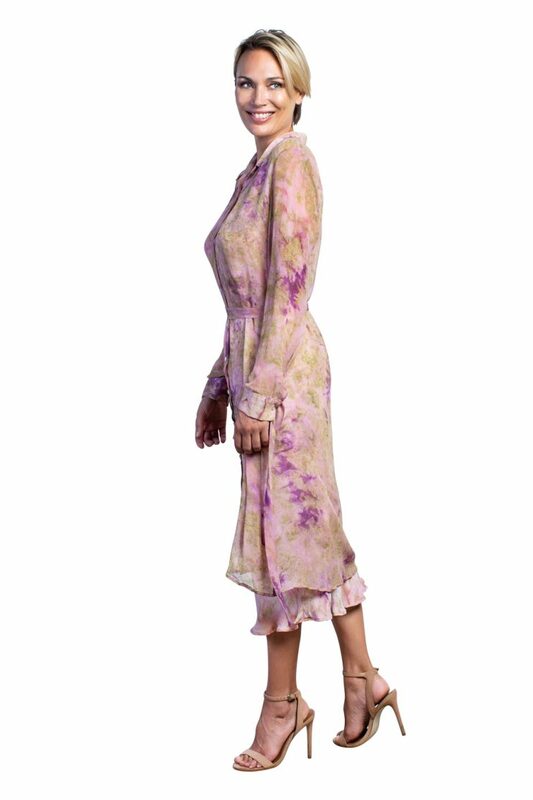 Feminine straight cut style with buttonhole and cuffs fastened with shell buttons and falls fluidly to a calf-grazing silhouette that can be cinched with the detachable waist tie. This print was created from impressionist brushes taken of distinct roses, pansies, adding water lily which will have a new nostalgic artistic quality. Ines measures 175cm and is wearing a S size. ·How to measure your body? Place one end of the tape measure at the fullest part of your bust and wrap it around your body to get the measurement, keep the tape parallel to the floor. To measure your natural waist,find the narrowest part of your waist, located above your belly button and below your rib cage. Wearable art in silk with color variation as a result of our hand technique of dyeing that ensure that each piece is unique. Orders are processed between 2-4 business days. After your payment is authorized and verified, it can still take up to two days to process your order. ISA LAVILLA® will contact you if additional information is needed for card verification or if any item goes out of stock unexpectedly. Some orders may be split into more than one package and shipped separate. All orders placed on a Friday after 12 pm will not be processed until the following Monday. We operate Monday-Friday 9am-5pm EST, except on Major Holidays. Pre Order sales will be shipped on the date announced in the product description. If for any reason the date of shipping changes customers will be notified via email. After an order is shipped, you will receive a shipping notification email that will notify you of the carrier we've used to ship your order and the different tracking options available for your order. Please allow up to 24 hours for the system to update. You will receive your order anywhere from 5-15 business days from the date that it is shipped out, not necessarily from the date it's placed. Keeping in mind that this is just an estimate and it doesn't include weekends and holidays; your order will be shipped out from Spain. ISA LAVILLA® is not responsible for lost or stolen packages that are confirmed as delivered; customers are responsible for any lost, stolen or damaged packages. Customers placing orders for International shipping agree to pay all taxes and customs duties when the package arrives in said country. Packages subject to customs may take extra time to be delivered, please keep this in mind when trying to estimate a delivery date. ISA LAVILLA® is not responsible for these or any additional costs. Enjoy Free Premium Shipping on all orders over 350Euros! If for any reason you are not satisfied with your purchase, you may return the items for exchange or store credit only. Exchanges have to be made within 15 days of receipt of purchased items. Please note that original shipping charges are non-refundable. Send an exchange request to contact@islavilla.com including your order number. Note that for the first request for an exchange shipping costs are on us (standard shipping). Shipping charges will apply for all subsequent requests regarding the same order. Items must be received within 14 days of exchange request. Purchases made with a discount coupon code may be eligible for exchange, and if so, shipping charges will apply. ISA LAVILLA® accepts items in their original condition, meaning: unworn, unwashed, unaltered, undamaged and with labels and tags attached. Please allow 14-21 business days from the time you mail your order for your exchange to be processed. We will notify you via email once your exchange has been processed. Items will not be accepted for exchange after 15 days of delivery. ISA LAVILLA® guarantees that our merchandise is free of manufacturing defects and will accept any defective item for exchange; having in mind that all garments are handmade. All purchases made with a discount coupon code and sale items are Final Sale. These are not eligible for exchange.